$500 M for the World’s biggest Water Hazard! If Jules Verne were a golfer, he would have imagined this course. 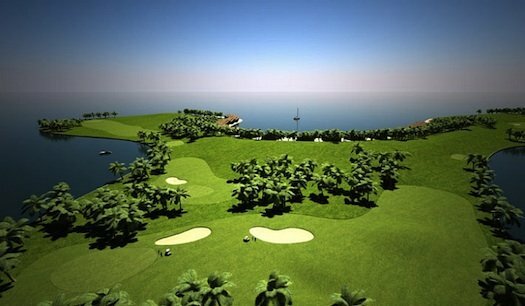 Floating architecture specialists Dutch Docklands Company, in collaboration with golf course developer Troon golf and Waterstudio are in process of developing the world’s first floating golf course. 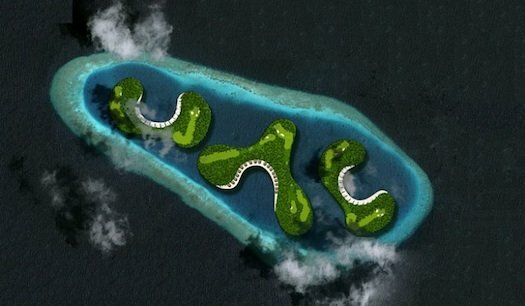 Located in the Maldives Islands, The Royal Indian Ocean Club, will be an 27-hole golf course built on 3 separate floating island platforms, connected by underwater tunnels. The floating islands will also be linked to an underwater clubhouse, as well as a series of hotels by more underwater tunnels. It has a number of innovative designs to deal with pesticides and construction in order to minimize its impact on the surrounding ecosystem of Maldives, whose highest point is only two meters above sea level. The state-of-the-art golf courses are expected to bring new wealth, investment and tourism to the country (tourism already being the top contributor to the country’s GDP). The artificial floating islands will incorporate technologies such as water cooling, water desalination, and the use of floating solar blanket fields. The budget of the project is $500 million and is expected to be completed in 2015. Can you hit a 300yd drive… with your putter? If your golf season is over and you’re dreaming about next year – here’s a little inspiration. 5 foot 11, 165 pound Jamie Sadlowski can drive his putter 300 yards. But remember, it’s not how long, but how many. I never had a hankering to play golf, despite growing up in Scotland just down the road from Bruntsfield Links, which is one of the oldest golf courses in the world. It wasn’t until I was taught enough golf to look as though I could outwit the accomplished golfer Gert Frobe in Goldfinger that I got the bug. 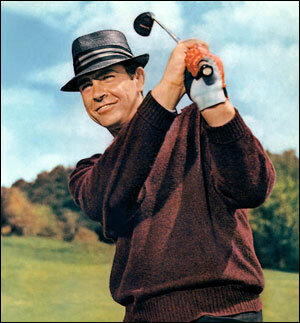 I began to take lessons on a course near Pinewood film studios and was immediately hooked on the game. Soon it would nearly take over my life. More than enough has been said and written about Tiger’s problems over the past two years. We thought we’d hide all the noise, and just share with you a great golf swing. For more versions of Tiger’s swing, you can click here, here, and here.